1.Season chicken thigh fillet with salt and pepper. Set aside. 2. In a small paellera pan, or frying pan, pour atsuete oil. Fry the chorizo and the seasoned chicken until slightly brown. Remove and set aside. 3. In the same pan, saute onions, garlic, and ginger. When aromatic, add rice, and saute until the rice is coated well with oil and slightly toasted. Season with salt, add vinegar, and simmer until slightly dry. 4. 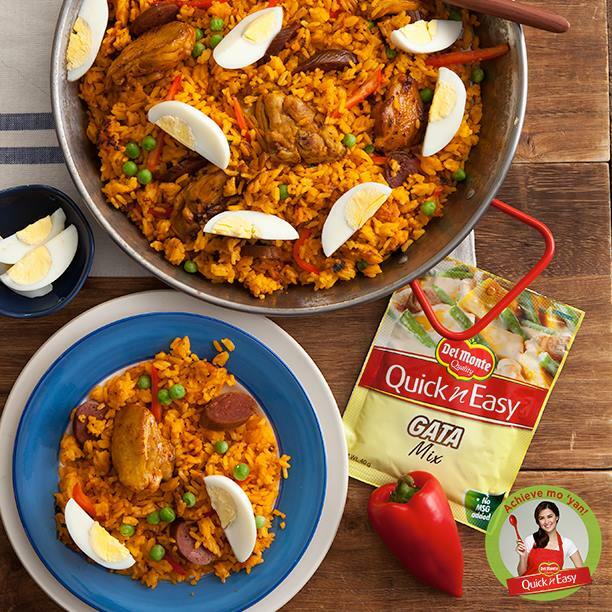 Pour DEL MONTE Quick N Easy Gata Mixture and boil uncovered. Once boiling, cover and simmer for 15 minutes. 5. Remove cover and garnish with bellpepper strips, and green peas and simmer covered for 30-45 more minutes or until rice is cooked. 6. Garnish with boiled egg, if desired.